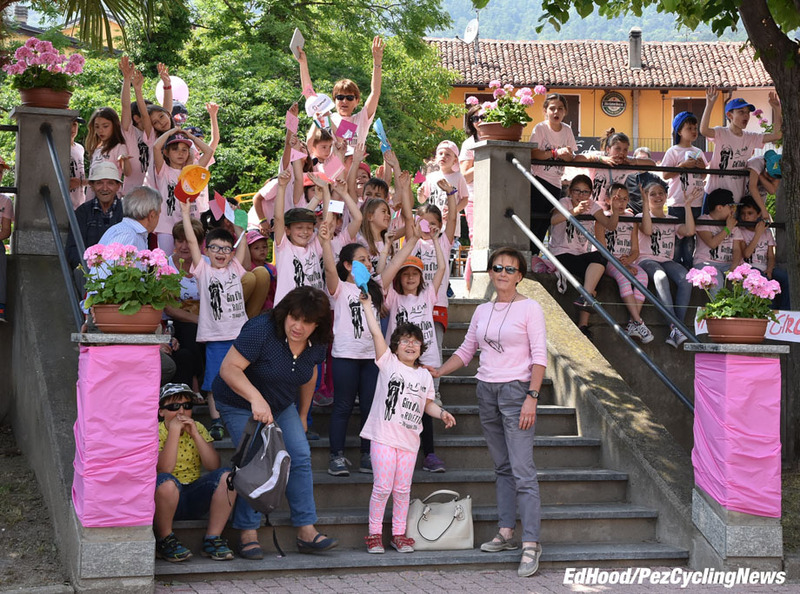 PezCycling News - What's Cool In Road Cycling : GIRO’16 Roadside: The Crazy Cobbles Of Pinerolo! 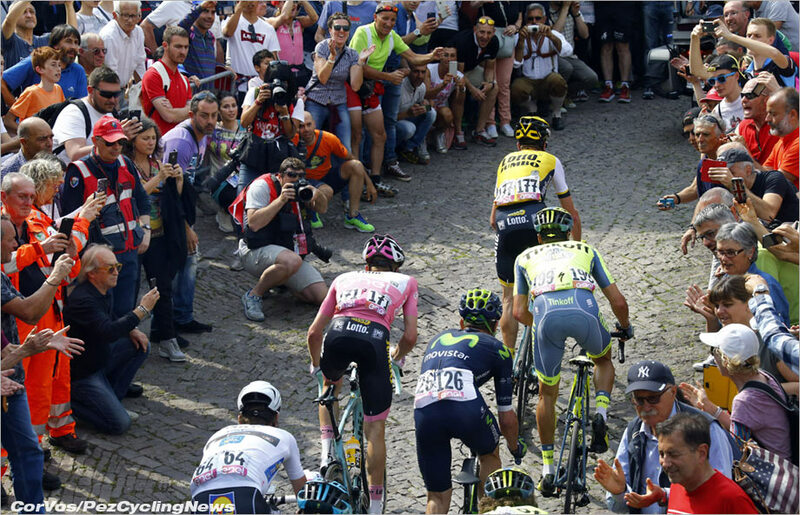 GIRO’16 Roadside: The Crazy Cobbles Of Pinerolo! 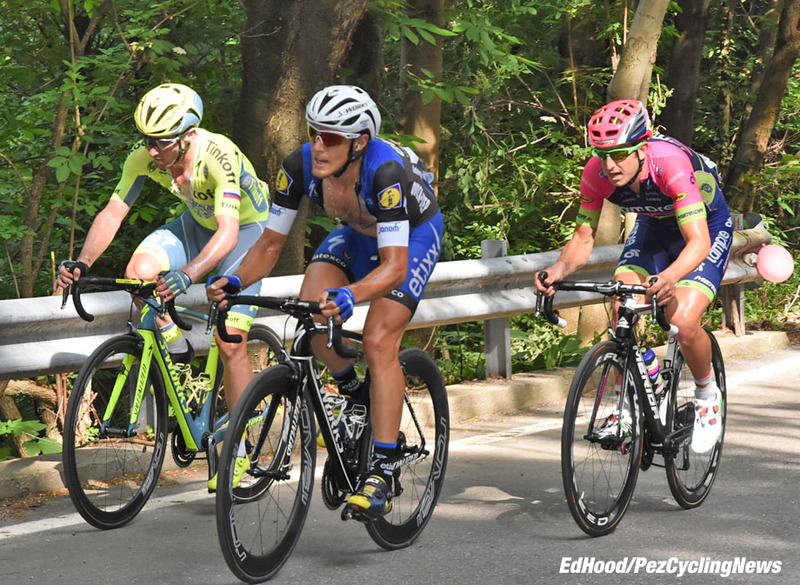 PEZ Roadside: After pizza, grappa and good night sleep, Ed Hood has moved a stage closer to the final of the Giro d'Italia in Turin. 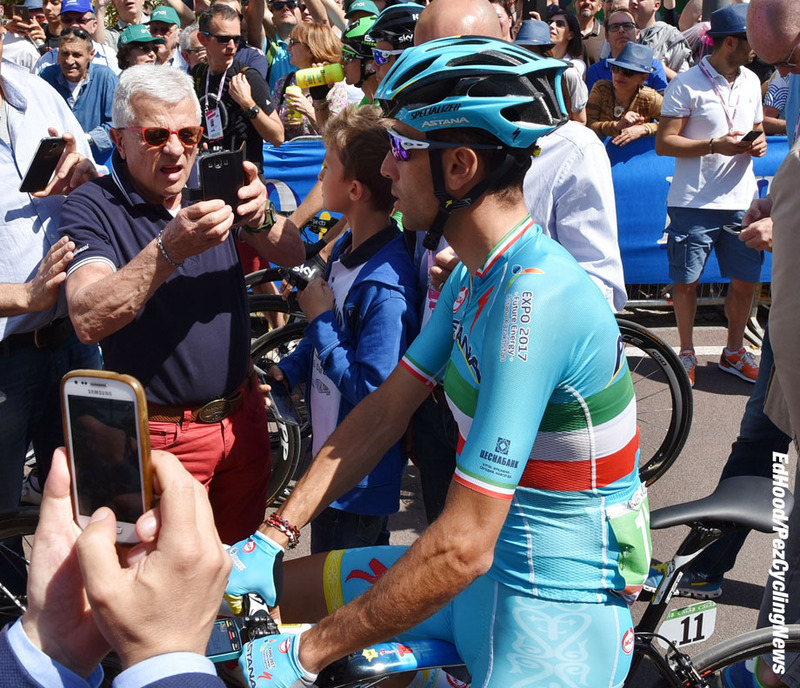 Today he takes in the sights at the start and on the those crazy cobbles of Pinerolo all surrounded by those 'Tifosi'. 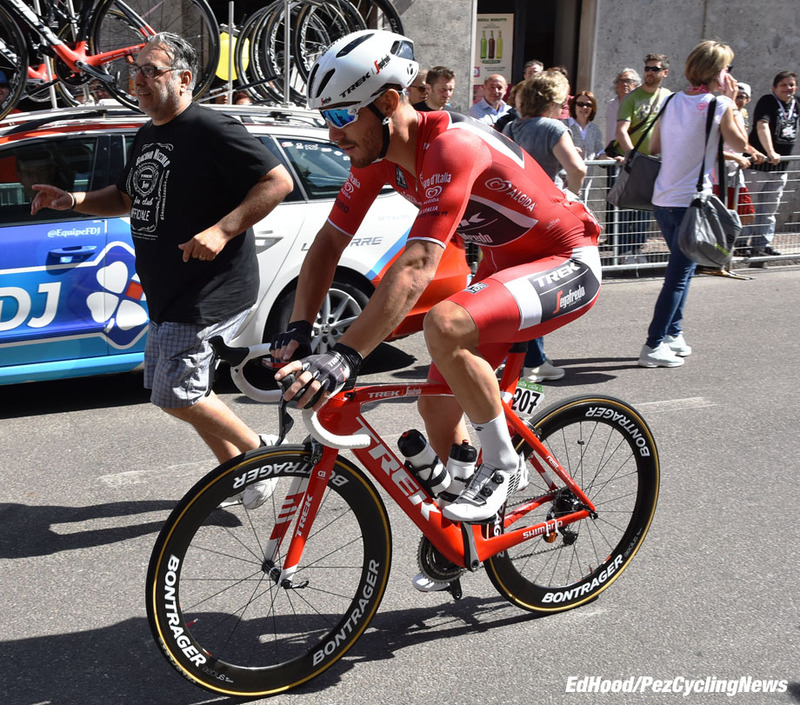 We had Quick-Step's Italian stage winner Brambilla down as the winner but it was teammate and countryman Trentin who got across to his team mate off the last climb to win on another good day of action in the 2016 Giro. . .
No nice vistas from my morning walk today - but I did pass our pizza place and grappa bar from last night. They were basic but just fine. The traffic into the start in the Milano suburb of Muggio was only a 4 out of 10 on the 'Losing the will to live' scale and we made the start in plenty of time. The nasty climbs in Pinerolo failed to ignite the fireworks predicted by Pez himself, but made for some excellent viewing. Today we wanted to be there for the roll out but thought we'd sample the hospitality first; too many people, too much of a janitorial vibe - it's edging towards the Tour. . .
We took up position on the stretch of road leading into the sign-on and start area - and waited . . .
First 'name' to appear was red (points) jersey, Giacomo Nizzolo (Trek and Italy) who's second place yesterday was his 13th Giro podium but he's never won a stage. Perhaps in Torino on Sunday now that unlucky 13 has gone? Never doubt how important the classifica jerseys are; Nizzolo's arrival was greeted with loud cheers and a multitude of autographs requests. The man who we still contend was the only cyclist ever to get away with a beard, Fabio Baldato, now a DS with BMC meandered past on a nice orange BMC 'town bike' - I could live with one of those. 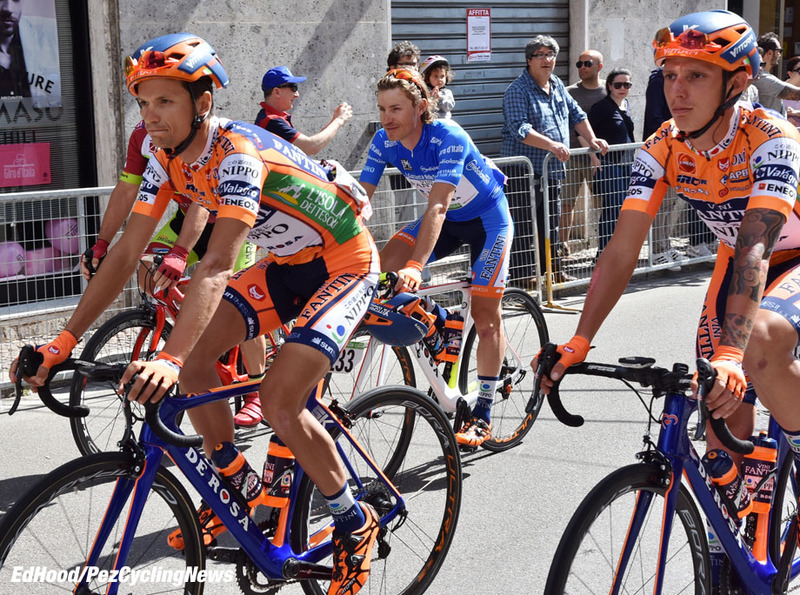 And there's the blue 'Montagna' jersey on the shoulders of Damiano Cunego, flanked by his Nippo-Vini Fantini team mates. 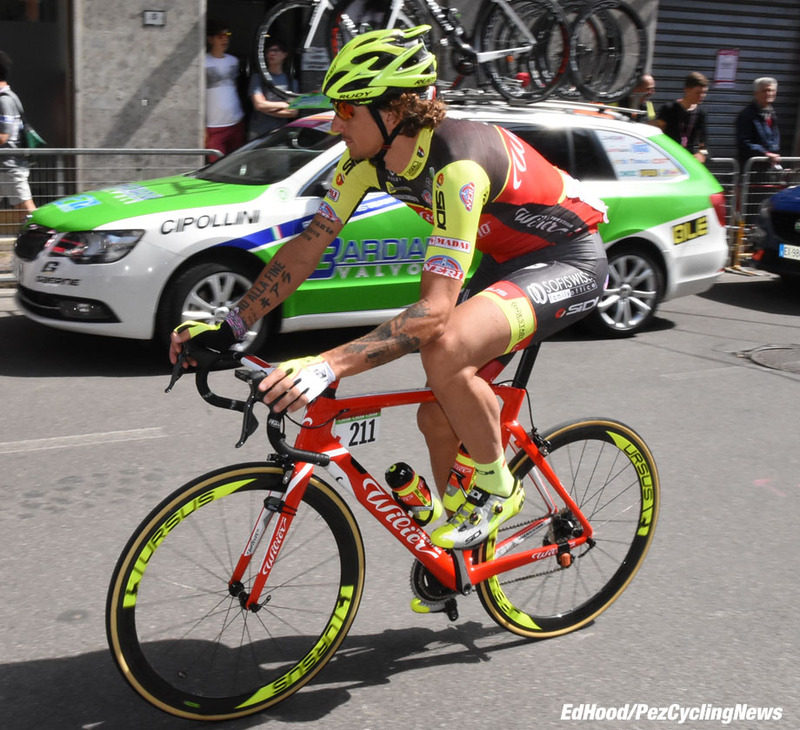 If Cunego can take that maglia to Torino it's a huge result for a Pro Continental squadra. 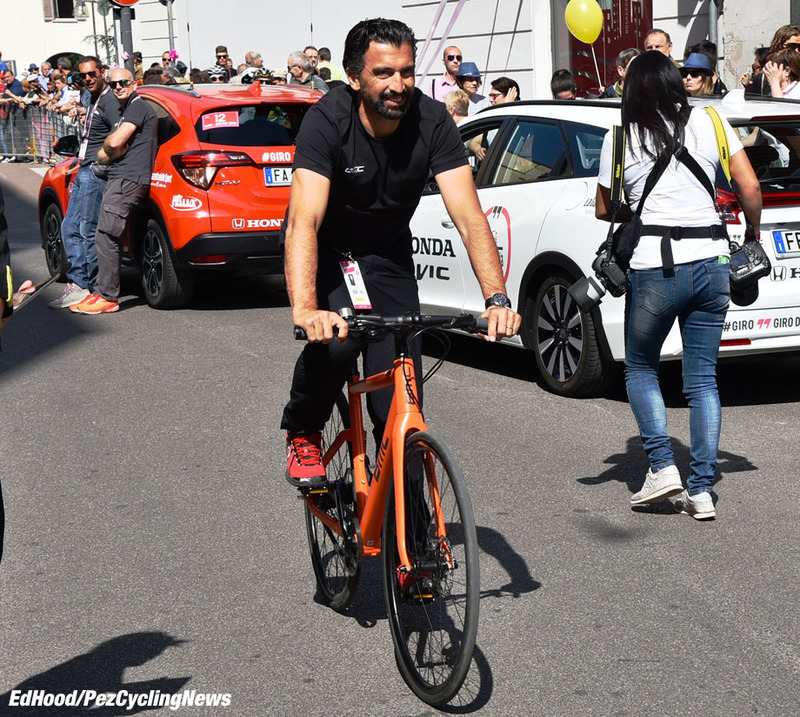 Former super sprinter, Adriano Baffi is a DS with Trek these days and borrowed one of the team bikes to pedal in to the sign-on. Pippo breezes by, old ladies squeal with delight when they see him, grown men shout his name, desperate for a wink or a nod - he may be a wee bit past his best but he's still a hugely popular figure and does look a million dollars, still. 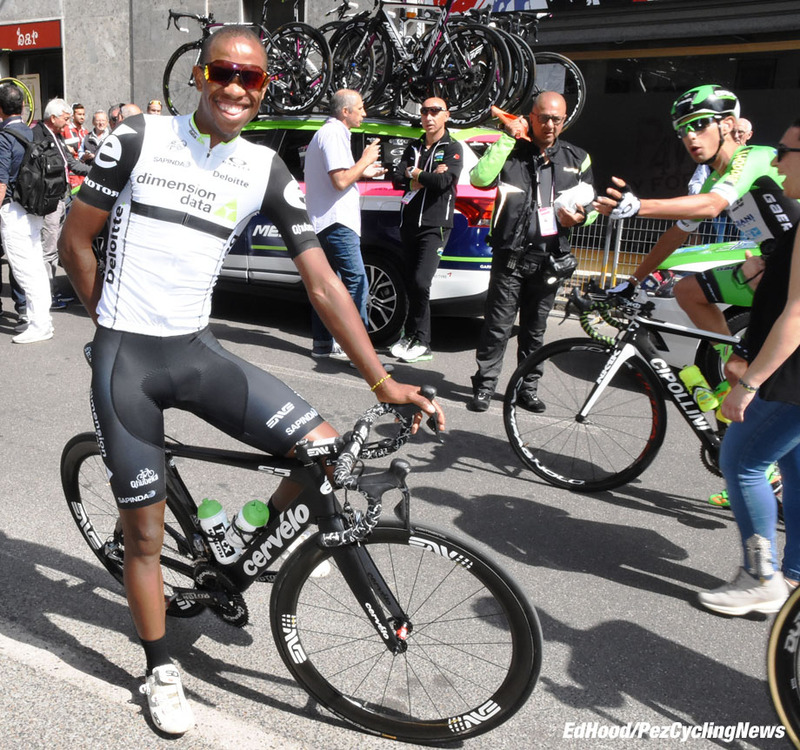 We interviewed Dimension Data's Songezo Jim a few weeks ago, he pulls up for a chat, meanwhile, one of the Bardiani guys protests that the South African isn't pretty enough to get his picture taken! Those young Italians! Songezo says that stage 16 - won by Valverde - was savage, full on all day and very fast. 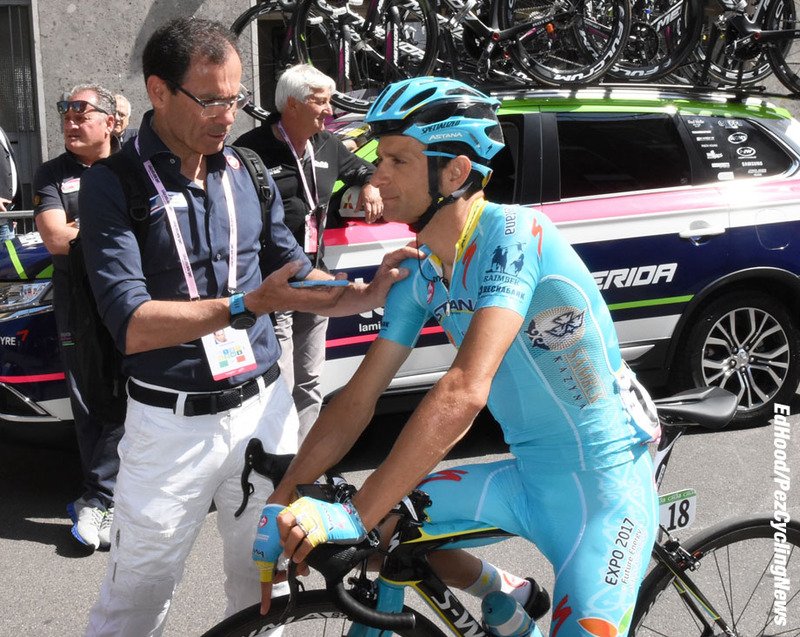 Former pro and now TV and newspaper pundit (and the man who exposed Michael Rasmussen's whereabouts scam) Davide Cassani chats to Nibali's right hand man, former Giro winner, Michele Scarponi. Vincenzo's current form is sure to have been discussed. 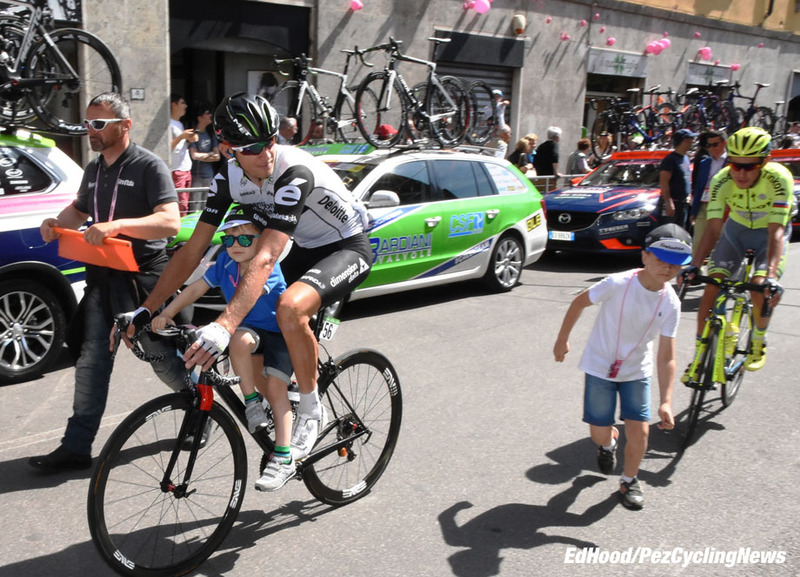 Meanwhile, Dimension Data's top ten on GC man, Konstantin Siutsou does a bit of child minding. An older guy pulls up alongside us to answer his mobile phone. It's 1966 Giro winner, Gianni Motta - we adopt an air of reverence and hope we'll look as good at 70-odd years-of-age. 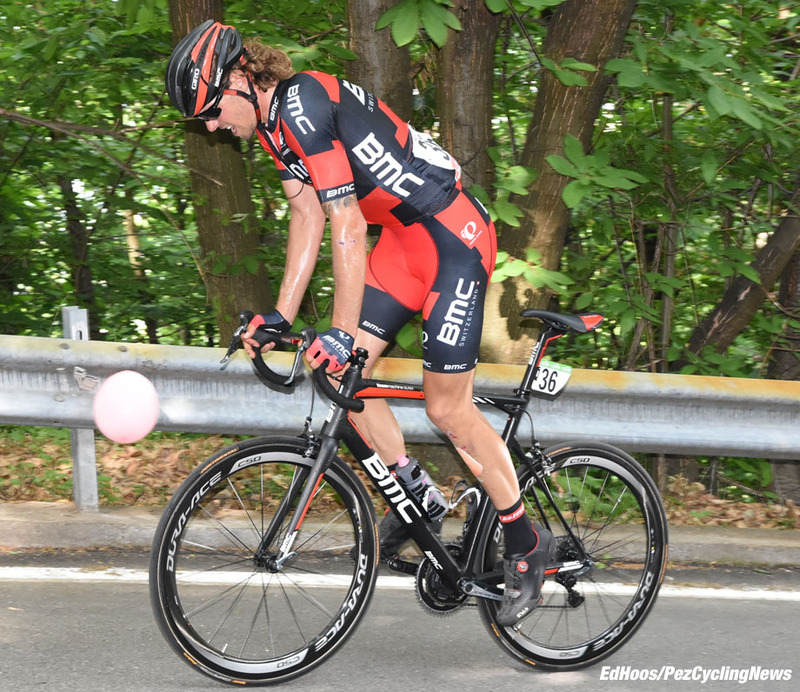 We contrived to miss the pink jersey as security were evicting hangers on when he passed. 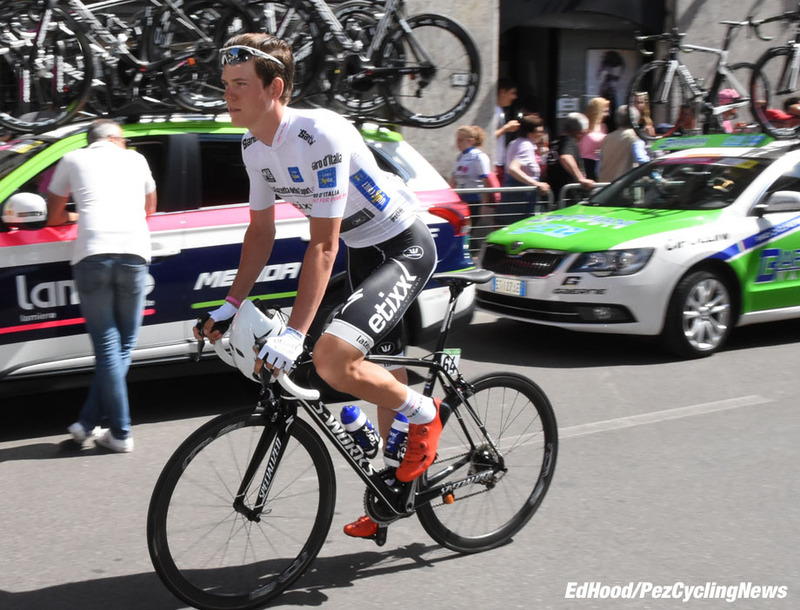 But there's the always immaculately coiffed Bob Jungels (Etixx - Quick-Step & Luxembourg) in the white jersey of 'Giovani' leader. A talented young man - and future Giro winner? 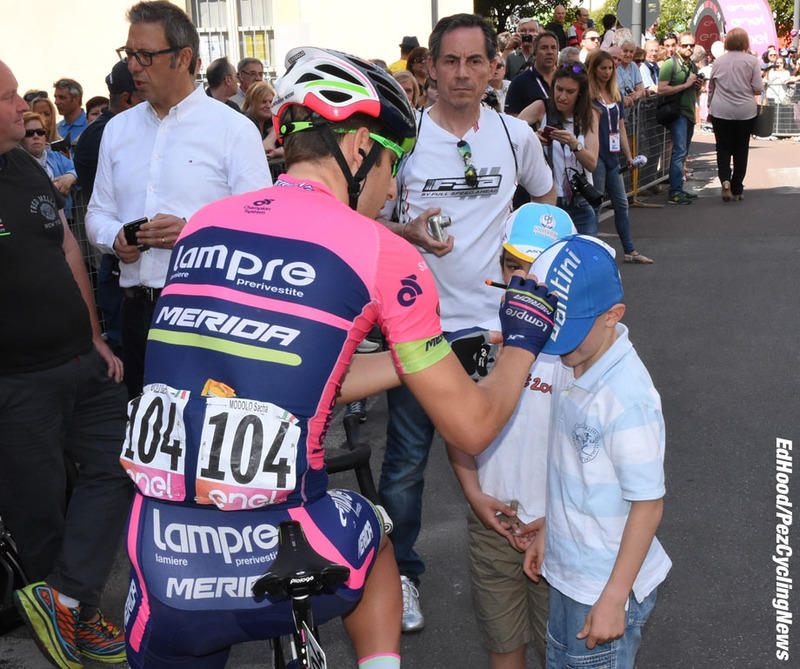 Fast man Sasha Modolo signs hats for the kids but must be highly conscious he now only has one chance left - on Sunday - to make this a successful Giro for him. The roll out approaches and we ease up towards the start line. 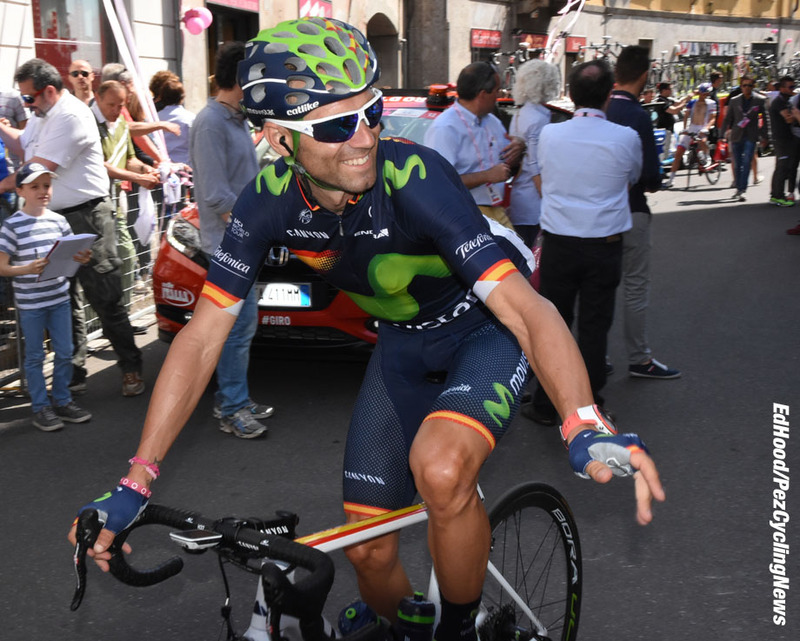 Alejandro Valverde looks happy and relaxed - another finish to suit his talents, today? Team mate Andrey Amador meanwhile is being interviewed for Costa Rican TV by an enterprising journo with a 'selfie' type set up and mic. 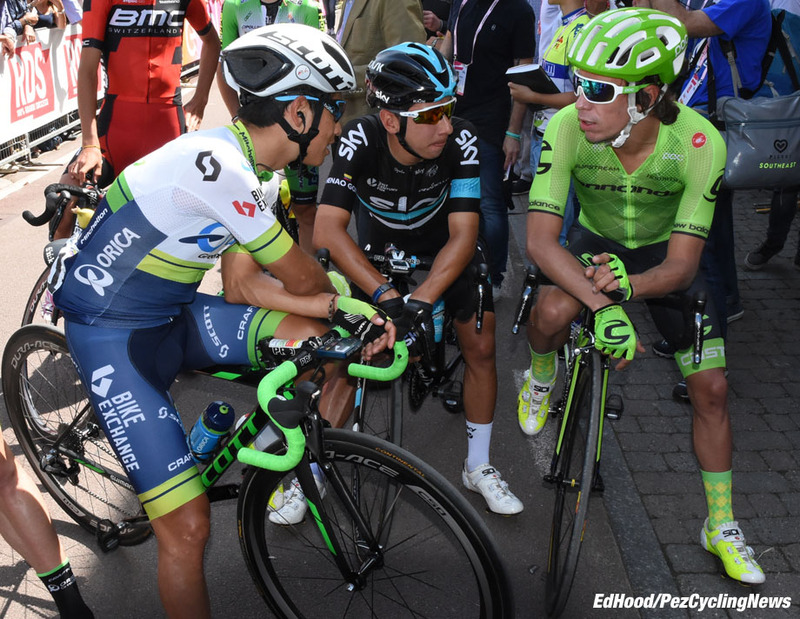 Sticking with South America, Colombians Rigoberto Uran (Cannondale), Sebastian Henao (Sky) and Esteban Chaves (Orica-GreenEDGE) are having a good chin wag about the old country. And there's Vincenzo - everyone reaches for their mobile phone. 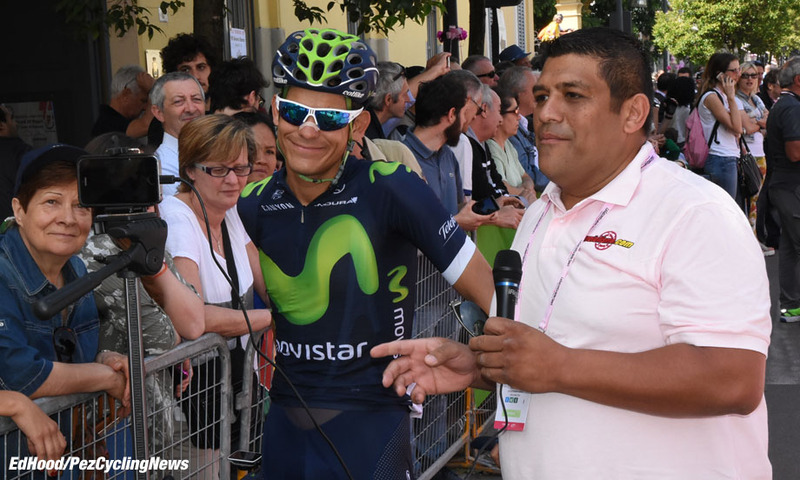 He's perhaps not having his best ever Giro - it's looking increasingly like Valverde will keep him off the podium - but the Sicilian is still immensely popular with the Italian public. It's mad, Visconti is still chatting to friends, Pippo is stopping for 'selfies,' Amador finally manages to tear himself away from the interviews and is off the back - crazy. But we love it. Next up, the only categorized climb of the day, the second cat. Pramartino. There will be a short intermission whilst Dave drives us 200K across the North Italian Plains . . .
OK, back on the percorso - Roletto, Cafe Eden, beer, sandwiches and coffee - perfecto. The kids are out to watch the Giro, Dave gets them to holler for PEZ. 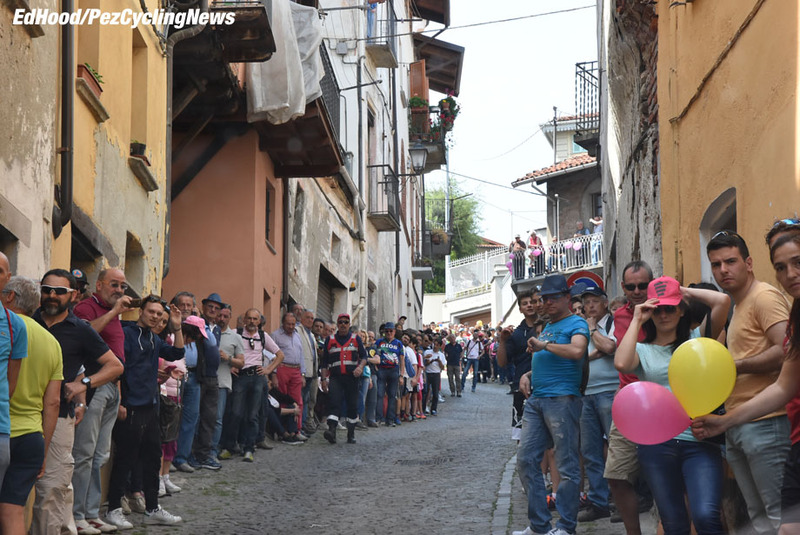 There's a finish loop, we pass through the line - it's a pretty technical finish but there's no need to worry about a bunch sprint, straight after the finish line pass for the first time the percorso heads into the back streets. Via Principi D'Acaja, 450 meters, average grade 14.5% maximum 20% - on cobbles. Savage. We get the wire that a break is away, a big one - 24 riders including Modolo and aforementioned, 'Big Rodge.' Someone has lobbed a hand grenade into the break, it's scattered all over the hill. Stage winner and maglia rosa for two days, Brambilla (QuickStep) and Moser (Cannondale) lead - it looks to us that the winner will be one of the two Italians. But the QuickStep man has 'insurance' in a team mate in the next little group - Trentin, who's with Modolo (wow !) and a Tinkoff - and anything could happen on that long, tricky descent back to Pinerolo. Their former breakaway compadres range from 'done in' to 'totally wasted,' some, like BMC's breakaway king, Oss are just too big for this kind of climb - others have just given their all and there's nothing left. 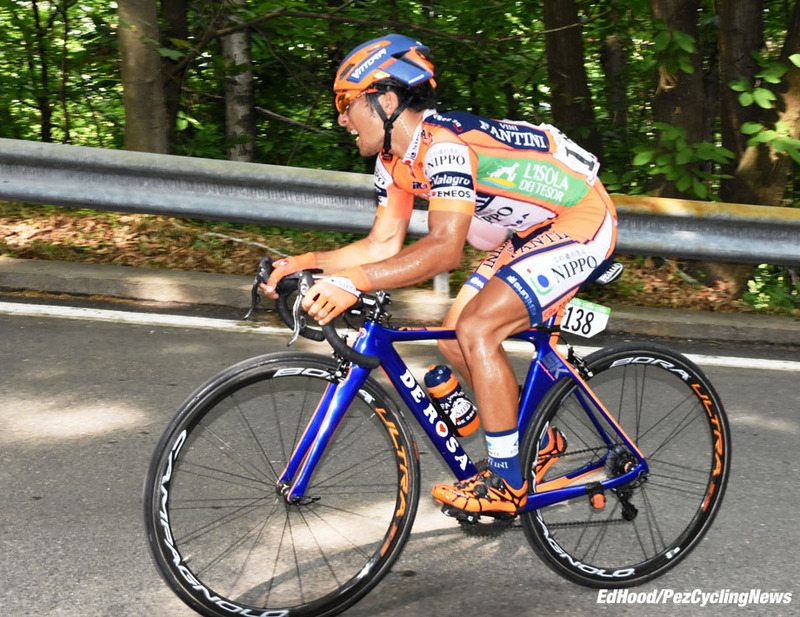 Nippo's Yamamoto zigzags the climb to try and ease the grade whilst it's all Ligthart (Lotto Soudal) can do to maintain forward motion, his head slumped low and every pedal rev a source of pain. 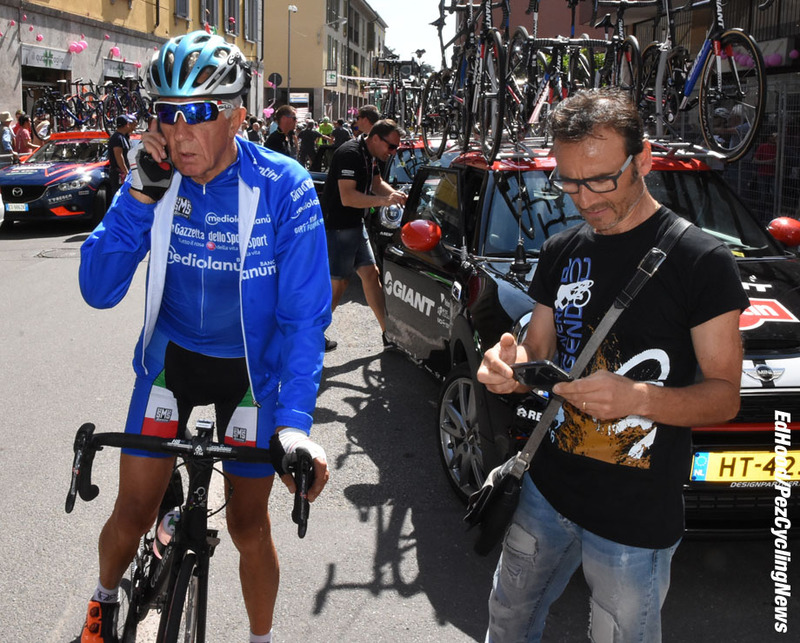 It's a big gap to the gruppo maglia rosa - and the man in pink is setting the agenda, Battaglin rides tempo and his boss is right on his shoulder. 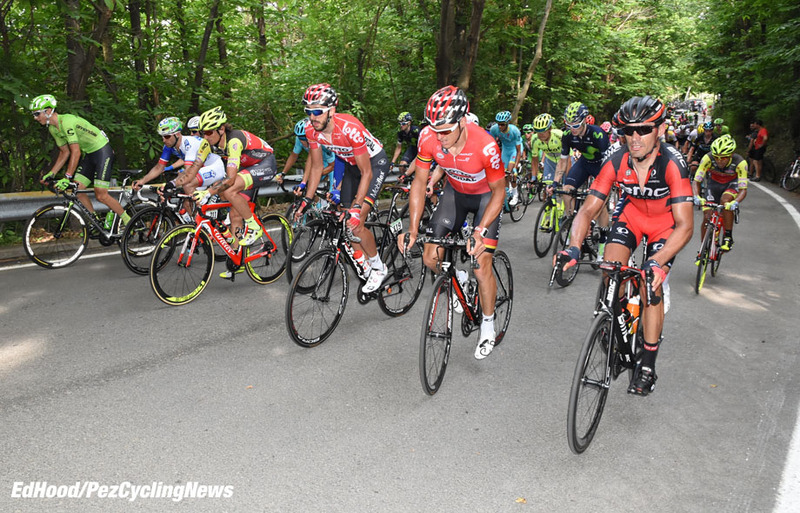 We pick up the other 'Bigs' in there - Nibali, Majka, Pozzovivo, Chaves, Valverde. . . The tempo is steady but no one looks 'easy' - Kruijswijk is well in charge. There's a lot of damage. Sometimes you'll hear the gruppetto before you see it, laughing and chatting - not on this hill. Ashen men sit silently in their own little bubble of hurt. We drive off the hill, the descent is as horrible as we'd heard. "At the end of the longest stage of the 99th Giro d’Italia, Matteo Trentin secured another stage win for Etixx-Quick Step – opening his Giro d'Italia account at the same time – after making substantial contributions to the earlier achievements of his team-mates Marcel Kittel, Gianluca Brambilla and Bob Jungels. 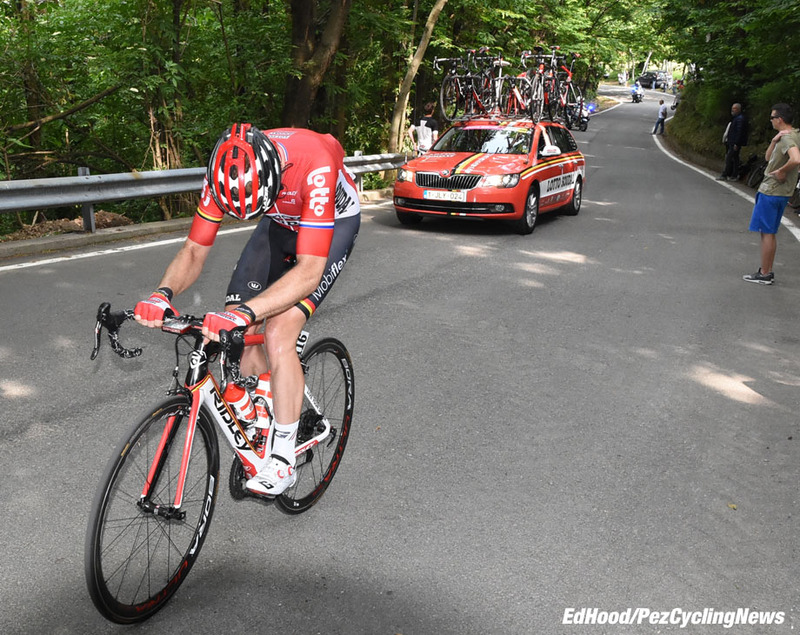 He surprised Gianluca Brambilla and Moreno Moser by darting past them in the last 300 meters while, far behind, Steven Kruijswijk led the group of the favorites in the climbs that preceded the finale in Pinerolo. The race leader avoided anything untoward in view of the two coming Alpine stages." I couldn't have put it better my self! Cima Coppi tomorrow, 2700 meters plus - my ears are popping already!